The EA uses economic news trading using low, medium and high news. The EA is set for each piece of news separately. Trading is conducted on 26 currency pairs and 3 timeframes from M5-M30. The EA uses trading on such indicators as CCI, Standard Deviation, Moving Average, Relative Strength Index, Momentum and MACD. Multi_Currency_BackTest - if set to true, a multi-currency tester is used. 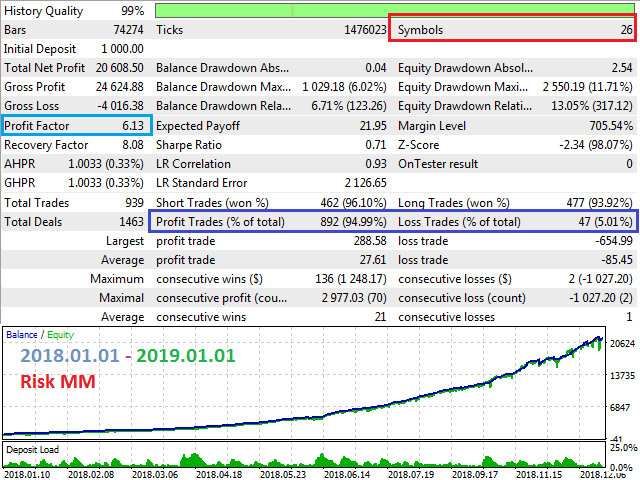 M1 OHLC (simulation of 1-minute bars, OHLC prices) or Open price only (quick method on complete bars). Every_Day_End - end time (hh:mm). Disable_in_Friday - end time on Friday (hh:mm). Very safe low drawdown and stable growth. Perfect EA for long term trading/investing. In general all top EA's from Ruslan are very well designed and safe with the right settings. Fixed bug in loading economic news for MetaTrader 5 new builds above 1881.